but does Bet Software really make money for you? What is bet software, otherwise known as a Betting Bot? 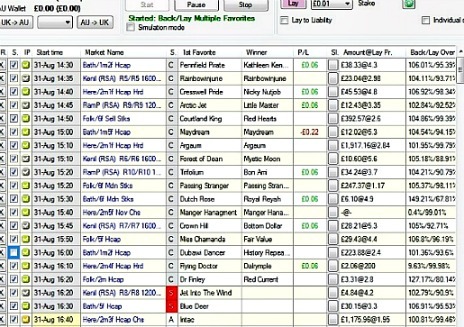 An exchange betting bot is either a specially written software interface, or a spreadsheet (Excel), that aids in the automated trading of horse racing, football, darts, cricket and all other events Betfair covers. Betting bots are nothing new, as similar software has been around for city trading for years, but it is only recently that they have been used for sports betting. Betting bots can be used for trading, hedging, dutching, arbing, automatic betting, and much more. It's been awhile since I first reviewd bet software on this website so it's timely to revisit the subject to see what advances have been made. Bf Bot Manager has 2 versions of its bet software and each one is available for free trial which means you get 12 days of free trial in total. Add-on bots are also available for free trial for 6 days. Just like any tale of fluctuating fortunes, this review of BF Bot Manager v2 has a beginning, a middle and a happy ending.For other testimonials click here. After Rade, the author of the software, kindly sends me the license keys the software downloads without fuss and I am soon up and running. Back/Lay favourites (horses) is my first choice as I know most about laying horses to lose and I choose to include the racing markets from UK & Ireland, Australia, USA and RSA - well might as well make a meal of it! There are numerous settings that you can adjust and even some you are advised to leave well alone, unless you know what you're doing! You can also choose the simulation mode to test your options before parting with your cash. But you will have to have a funded Betfair account before you can do anything, although this need not be large, as stakes are accepted as little as £0.01. As my trial license is only for 9 days I opt to use minimum stakes and leave all other settings on default. As things are going well I increase the Recovery Stake option to £0.50 which adds this amount to the stake for a bet placed to recover losses. Nothing untoward occurs and I end the day with a £1.23 profit. I visit the forum and register - although you need to be confirmed by admin to post, you can search and read existing posts - seems to be quite lively with plenty of comment and owner is open to suggestions for improving The bet softwares systems. Rade the programmer plays a leading and active role responding to users requests and suggestions for improvements. 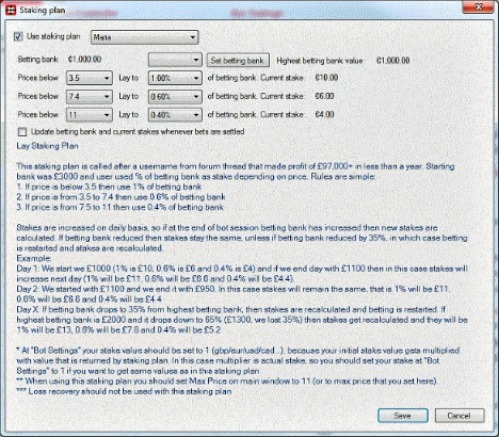 Start software at 2.30pm and Bot runs smoothly, placing appropriate bets thanks to our new staking friend, Maria and the day ends with a comfortable profit of £0.48 using minimum stakes. "I read your review and it seems fine to me. If you continue to use software and chat on forum I am sure that you will learn how all settings work and find several different other ways to use our bots. In members section there are several test settings by other users, some are profitable and some are not. Most users that use loss recovery have high strike rate, 90+% so that rarely they have two losses in a row." Please feel free to publish this review.